For the last decade, startups have been changing the business world as we know it. Companies like Uber and Airbnb have revolutionized their respective industries — all without owning a single hotel room or vehicle. At a time when one new idea and one new startup can disrupt an entire industry, it can be an intimidating for established companies. With every new company like Instacart, Breather and Poshmark, the rules of the traditional business game continue to change. In the last 12 months, there have been more than 100 examples of established brands joining in the collaborative economy. I analyze and track every publicly-known deployment of large companies in the collaborative economy as part of a research initiative with Crowd Companies and Jeremiah Owyang. Corporate adoption of collaborative models is accelerating, and there are significant opportunities for established businesses to learn from and participate in the collaborative economy. The New Rules of the Collaborative Economy, a report from Crowd Companies & Vision Critical, maps out three paths to help established companies connect better with their customers and compete in the collaborative economy. The new report forecasts that by 2017, eight in 10 Americans will be part of the collaborative economy. More than 110 million people in the U.S. and Canada have participated in some form of sharing in the past year. The growth of collaboration means established businesses must consider how to compete in this new economy. Many adopters of collaborative economy services are driven by price. More than half of North Americans will shift to sharing instead of buying if they can save at least 25 percent of the cost. Established brands can offer a price and value-driven solution for customers by launching a peer-to-peer marketplace. Peer-to-peer marketplaces are web-enabled services that lets customers buy, share or trade goods and services from your brand. Established companies like Ford, Home Depot and Walmart have all successfully launched peer-to-peer marketplaces for used goods. A peer-to-peer marketplace can work for both goods and services in B2B and B2C industries. This is the best fit for companies with a history of creating successful online communities, customer platforms or e-commerce sites. Sharing is makes many things simpler and easier. 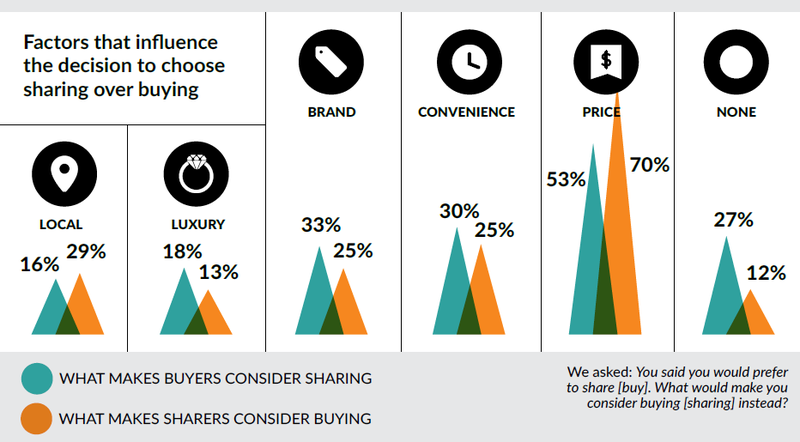 Convenience is ranked as the top reason people using sharing services, and a third of conventional purchasers will consider sharing if it offers a more convenient option. Established brands can offer convenience to customers through brand-as-a-service offerings that often feature rental of durable goods, convenience-based services or subscription models of delivery. Established companies like Nordstrom, Waffle House and Whole Foods have all successfully launched on-demand services focused on convenience. Brand as a service works best when the brand has products that can be rented or offered on-demand. This is the best fit for companies with higher unit price products that serve a temporary need or that already have strong brand equity among customers. People naturally gravitate to well-known brands; they may be established companies or trendsetting startups. In the collaborative economy, customers turn to brands to determine whether a transaction is trustworthy. Across all age groups, brand is as important as convenience in determining whether a customer will consider sharing. Established brands can build their brand and credibility in the collaborative economy by using new technologies to work more closely with customers to develop and refine products and services. Brands can connect customers closer to the innovation process by enabling the maker movement or crowdsourcing. Established companies like Hyatt and BMW have successfully built brand equity through new programs focused on innovating and improving the customer experience. Bringing customers closer to the innovation process helps companies become more customer-centric. This is the best fit for companies with a strong R&D culture, in a maker industry or with a many loyal brand advocates. While it may seem the peer-to-peer economy would make established companies and branding irrelevant, big brands actually matter more than ever. 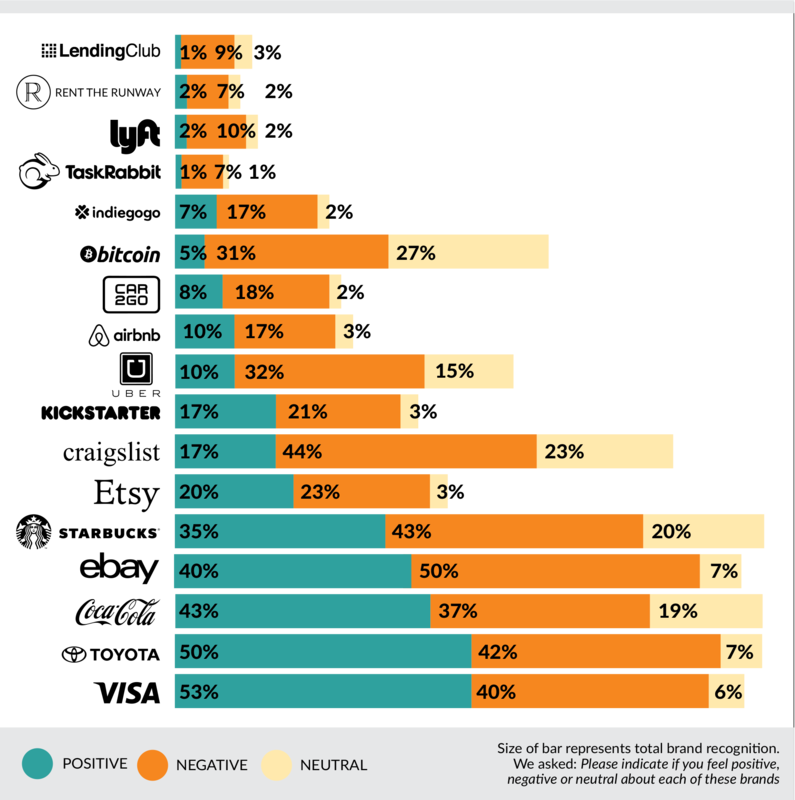 Brands serve as a promise for product or service quality, and in the collaborative economy, customers will turn to brands to determine whether a transaction is trustworthy. Many leading companies of the collaborative economy have as much brand recognition as the biggest traditional brands. Established companies like Intuit, Patagonia and General Electric have each successfully partnered with collaborative economy startups more than five times. Partnering with a sharing startup is a good way for established brands to build their capacity and comfort for collaboration. This is a good fit for companies that aren’t yet ready to launch their own sharing initiative independently. To compete in the collaborative economy and to learn how to serve customers in new ways, established companies should recognize the role of price, convenience and brand in driving traditional buyers towards sharing. Sharing is disrupting traditional business and companies will win in the collaborative economy if they can change to meet the evolving needs and priorities of their customers.